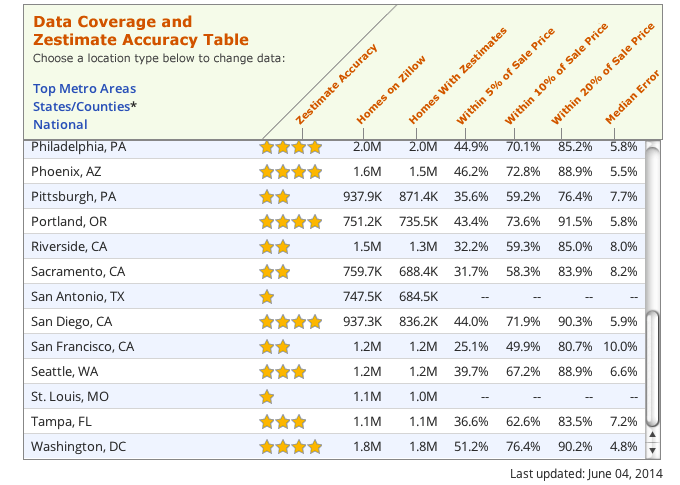 Some of Zillow’s own stats on the accuracy of its Zestimates. As you can see, the margin for error ranges from as low as 4.8% in D.C. to a whopping 10% in San Francisco. If you’ve looked at real estate in the last few years, you’ve almost certainly reviewed the listings on Zillow.com and you’re probably quite familiar with the “Zestimate,” the site’s automated approximation of what the property is worth. Some realtors say Zestimates are useless and cause confusion for their customers, while Zillow defends the data. Interestingly, both sides use the same stats to argue their case. The popularity of Zillow, mixed with buyers’ and sellers’ desire to have some sort of definitive number to slap on a property, results in too many people looking at Zestimates as gospel instead of the mere starting point that the site intends them to be. Which, as he points out, is similar to Zillow’s own stats for the D.C. area. The question is whether that it’s okay to be within 5% of the actual value half of the time. Not surprisingly, the realtor says no. He points out that this means that the other half of the time, the Zestimates can be 10-20% or worse off from the actual sale price. In fact, Zillow’s data shows that around 1-in-10 D.C.-area homes sells for more than 20% off (higher or lower) its Zestimate. In a market like D.C., Northern Virginia, and Maryland, there are some pretty pricey houses, so being off by even 5% can easily mean $15,000 to $50,000 of a difference. And the problem is much worse in other markets. For example, in San Francisco — one of the most expensive areas to buy in the country — only 25% of Zestimates fall within 5% of the actual sale price. Zillow defends Zestimates, saying they have not only improved in recent years (the realtor agrees with that) but that they now are similar to what you’d get from a human real estate agent. Beyond that, Zillow says that Zestimates are just meant to provide a helpful snapshot and that the number calculated by its computers should not be taken as the definitive estimate. I took a look at the Zestimates for my neighborhood in Philadelphia and found some very confusing Zestimates. My neighbor to the right has a house Zestimated at 50% more than mine while the house to my left is Zestimated 30% less. Thing is, these are virtually identical properties; all the same size, number of rooms, built at the same time, etc. If I believe the one neighbor’s Zestimate, I’d be an idiot not to sell and run off with a huge profit. But if I turn the other way, I’m underwater on my mortgage and won’t be able to sell for years. What all of this means is that Zestimates are just a number and they’re only based on publicly available data. It doesn’t know that the counters in a home are ugly as sin, or that the previous owner had a cat with a bladder-control problem, or that the seller has lovingly cared for every inch of the property for three decades. No matter how much you wave it around and point to it with urgency, a Zestimate isn’t going to convince a stubborn seller to come down on a price or a bargain-hunting buyer to improve his offer. Previous How Come Garlic Is So Darn Delicious Yet Causes Such Nasty Stink Breath?